Hydrodynamic and unique, get to the finish first in our limited edition Powerskin ST 2.0 jammers for men. 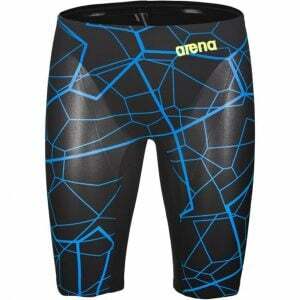 Printed allover with a dark tonal geometric pattern with contrasting triangles, this bold racing swimsuit is designed for swimmers of any level. It is made with three high-tech knit fabrics and a long-lasting lining for maximum muscle support and freedom of movement. 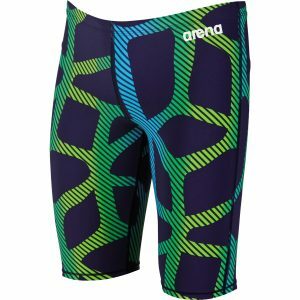 Strategic seam placement enhances your body?s position in the water, and all seams are flatlock for a comfortable fit. The Fuse technical racing suit is an introductory-level racing suit that offers elite-level benefits. The Fuse is constructed with a unique hydro-reflective textile to provide UVA/UVB protection. The resilient properties of the fabric ensure a comfortable fit and reduce drag. The suit is designed to provide flexible compression without limiting range of motion. The bonded seams and durable features of the Fuse offer a versatile and universal fit. Experience the power & speed of Carbon without sacrificing any freedom of movement with arena's new POWERSKIN Carbon Flex VX. The Flex VX incorporates arena's patented V-Flex construction - designed with revolutionary placement of seams to privde maximum range of motion - in combination with intelligent muscle compression and a power return system for unprecidented fit & support. 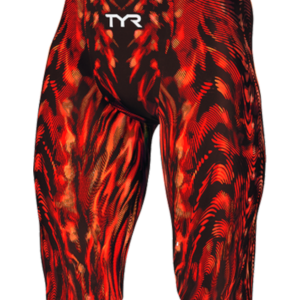 Get the NEW Limited Edition POWERSKIN Carbon AIR Jammer racing suit now in an incredible printed colorway! POWERSKIN Carbon-Air combines innovative design, breakthrough technology and an ultra lightweight fabric. Built with a horizontal carbon band construction delivering intelligent compression while maximizing range of motion and feel for the water. Part of the POWERSKIN Carbon Series, the POWERSKIN Carbon Flex features all the power of the intelligent compression and Arena's proprietary Carbon Cage, the POWERSKIN Carbon Flex is the first product in the Arena family to use the patented V-FLEX SYSTEM. This revolutionary construction, featuring taped and bonded external rear seams, provides swimmers with maximum range of motion and freedom of movement around the hips, glutes, and shoulders (women's FBSL) and allows for unrestricted flexion and extension in all directions. A favorite of Olympians and Rio 2016 medalists Connor Jaeger and Chad Le Clos, the Carbon Air tech suit combines the benefits of the Intelligent Compression with maximum comfort and a sleek construction. These features make the Carbon Air especially easy to put on. 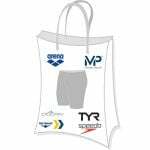 Swimmers looking maximum comfort, ultimate range of motion, and a familiar fit, start here. On Fit: Stay with your practice suit size for the most flexible fit or size down one size for enhanced compression. Powerskin ST is a highly performing racing swimsuit made of X-Raptor, a very light knitted fabric, specially treated to obtain an extra smooth outer surface. Thanks to the thinness and higher content of Lycra (29%). Powerskin ST ensures outstanding comfort and dries very quickly. X-Raptor fabric also guarantees excellent durability in chlorinated water and protection against ultra violet rays (50+ UPF). PowerskinÂ® ST is a highly performing racing swimsuit made of X-Raptor, a very light knitted fabric, specially treated to obtain an extra smooth outer surface. Thanks to the thinness and higher content of Lycra Â® (29%). PowerskinÂ® ST ensures outstanding comfort and dries very quickly. X-Raptor fabric also guarantees excellent durability in chlorinated water and protection against ultra violet rays (50+ UPF). 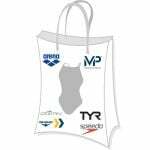 Welcome to the Making Waves USA Grab Bag Special for Jammer Performance Suits. Welcome to the Making Waves USA Grab Bag Special for Brief Performance Suits.